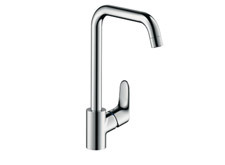 The Hansgrohe brand is extending its range of kitchen mixers. In addition to a new manual product, for the very first time we are including an electronic kitchen mixer in the PuraVida product range. The material demonstrates unrivalled quality in the detail. DualFinish with a stainless steel look means you have a base unit brushed underneath and polished on top. In the Focus E² range, we now also have a brilliant kitchen mixer whose appeal lies not only in its price, but also in its great convenience. The electronic control unit can be placed on, behind or next to the sink: independent of the spout. The particularly ingenious thing about it is its user-friendliness: press once: cold water, press twice: mixed water, press three times: hot water. Cold and hot water are each visually indicated during this process The temperature is seamlessly regulated. Available in DualFinish stainless steel and in pure chrome. This control unit can also be placed anywhere around the sink unit: wherever you want. The high, swivelling spout in the typical, sensual PuraVida style creates a large amount of free space for working in the kitchen. High-quality design and a wide range of functions at an attractive price: the high, swivelling spout is a little miracle of convenience. It creates plenty of space between mixer and sink. Available in chrome or an elegant stainless steel look.